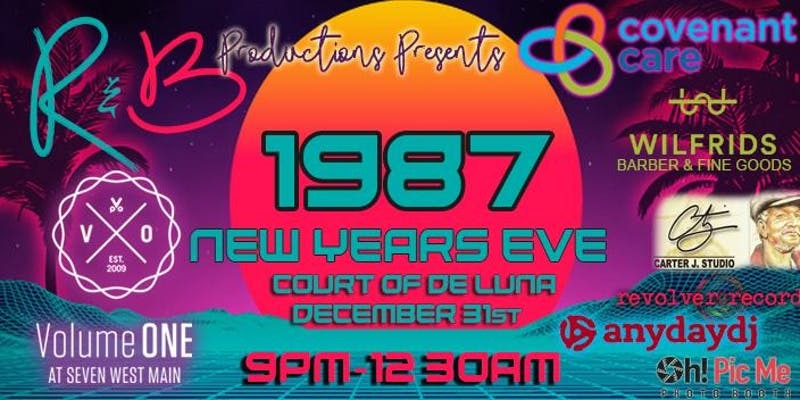 1987 Prom New Years Eve Party will be an unforgettable evening of Black Lights and Teased Hair. It will feature the hottest DJ in town mixing the top 80s music infused with today's hottest music. And from Snow cones to Live art drawings this is going to be THE HOTTEST party to attend for New Years. The question is, Why would you be anywhere else?? $25 cover charge gets you in the door and your first drink is FREE. Buy two and it’s $40 with 2 drinks for FREE. Gate opens at 8 pm and the first 100 people get a gift. Grand hall opens at 9:30 for the dance party. If you have any questions about anything please, contact us at 850-712-1951 or rnbprd1987@gmail.com...Thanks! All logos and trademarks in this site are property of their respective owner. The comments and listings are property of their posters. All the rest Copyright © 2019 by 850area.com. All Rights Reserved.